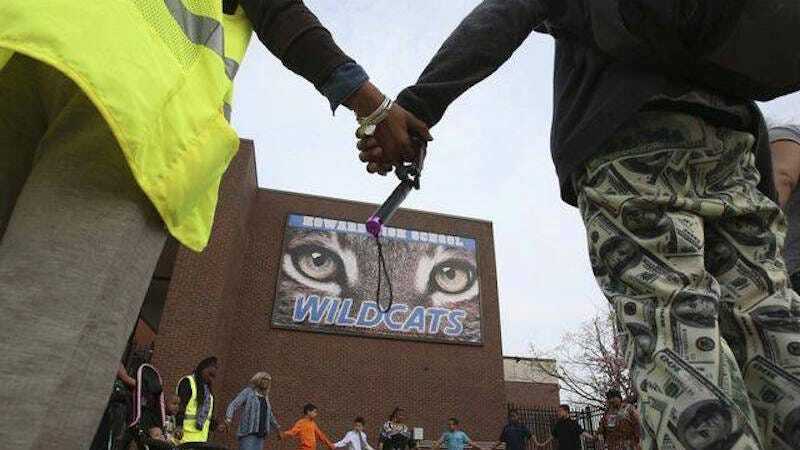 A tenth-grade girl died Thursday, April 21, from injuries sustained during a fight in a bathroom of a Delaware high school. The 16-year-old girl, who attended Wilmington’s Howard High School of Technology, was involved in a “physical altercation” with a “few female students” on Thursday morning. After the fight, she was airlifted to the hospital where she died. At a vigil this morning, friends said that the victim, identified on social media memorial pages as Amy Joyner-Francis, was “quiet” and known for diffusing fights. A friend told The News Journal that he didn’t believe Joyner-Francis entered the bathroom with the intention of fighting, “She went in there to talk things out,” he said. Mourners also shared memories of Joyner-Francis on a Facebook page dedicated to her memory, as well as the Twitter hashtag #RIPAmy. Image of vigil for Amy Joyner-Francis via Facebook.